When you’re accustomed to the stability of a 9-5 job and a monthly paycheck, taking the leap to be your own boss can be a big decision. Choosing to be a business owner comes with its risks and rewards. Online marketing has created a competitive edge for many businesses but, because it’s accessible to businesses of all sizes, it has also created a competitive landscape. Before you hand in your resignation letter or invest thousands of dollars in advertising, you’ll want to find a business idea that others want to buy into. Think about the point of difference you want to bring to an industry and consider the audience you want to target. The great thing about starting a business in 2018 is that you don’t need a big budget. You can start small and grow your marketing efforts as your business grows. Business owners often wear many hats when it comes to running a business. They are the Head of Marketing, the business accountant, Logistics Manager and a Customer Service Representative, just to name a few. While you probably can do all of these things on your own, sometimes it’s best to outsource the area you don’t enjoy and leave it to the experts. Focus on what you do best and then find experts where you need help. For example, outsourcing your online marketing could leave you time to focus on the areas of business you’re better at, like sales, business development or partnerships. Entrepreneurs like Marie Forleo continue to grow their global businesses with small and highly effective teams. Did you set your business up while you were in your 9-5 job? How did you balance a day job and a side business? What were some things you did to make the transition from full time to quitting - did you scale back your full-time hours to part time? How long did it take for you to quit your full time job? What were some things you did to manage the risk of owning a business? What did you do to get your first few customers? Before you quit your job, have a plan in place so you and your family are protected financially. If you haven’t started your business alongside your 9-5, quitting and building a business from a clean slate can be exciting and challenging. 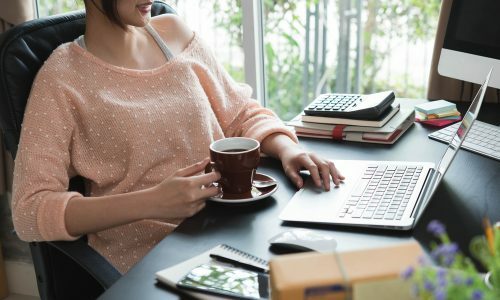 Starting a business can be cost effective with online marketing but you’ll need to factor in that for the first few months, you may not have an income stream. Experts often suggest to have 6 months of living expenses covered before you decide to make the move. Another thing to consider when making the transition is your new schedule as a business owner. You won’t be confined to the working hours of a day job, but you still need to create boundaries to avoid burnout from working around the clock. Set office hours in place and make sure they are communicated to your family and customers. Ready to start a new business idea or grow your existing one? We can help. Contact our team of online solutions advisors to get started.